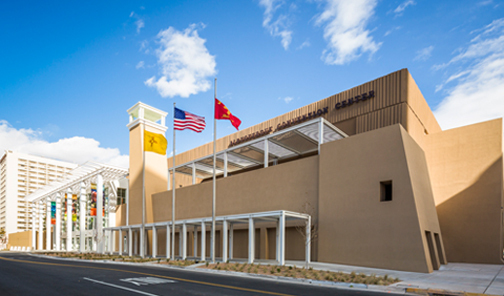 The Albuquerque Convention Center, owned by the City of Albuquerque, is located in the heart of downtown. It is comprised of the Kiva Auditorium, Northwest Exhibit Hall, Southwest Exhibit Hall, Ballrooms A/B/C, Northeast Exhibit Hall, Southeast Exhibit Hall and 30 Meeting Rooms. The center is operated by SMG, who, with more than 28-years of experience, is the world’s leader in successful facility management. Headquartered in Philadelphia, SMG also provides construction and design consulting, pre-opening services, sales, marketing, event booking and programming to more than 200 venues in 41 states, Puerto Rico, Mexico, Canada, Europe, China, and the Middle East. SMG also controls more than 1.5 million entertainment seats worldwide and manages more than 10 million square feet of exhibit space. For additional company information, visit www.smgworld.com. Are you ready to start planning an awesome experience?